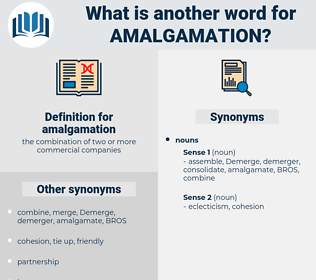 What is another word for amalgamation? Reintegration, reunion, blend, reorganization, regrouping, Mainstreaming, regroupment, compilation, mixture, cantonment, confusion, inclusion. Conflation, fusion, incorporation, merging, Fusing, blending, mix, meltdown, melting, bonding, Smelting, realignment. A prince of some Liberal country was what was wanted: there was even some talk of offering the crown to the English Duke of Edinburgh, while one party dreamed of an Iberian amalgamation, and suggested Dom Luis of Portugal or his father Dom Ferdinand, the former regent. About the same time also interviews took place between the Midland and the London and North - Western, with the object of arranging an amalgamation of the two systems.